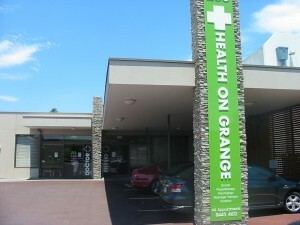 Health on Grange Physiotherapy was established in 2007 in a purpose built, new modern practice. All of our rooms are private and our highly trained physiotherapists offer individualized hands-on treatment. A fully equipped gymnasium is also available for pilates (spinal stabilization exercises) and rehabilitation facilities. We offer physiotherapy for a variety of conditions and patients including elite level and recreational athletes as well as those with non-athletic injuries and general joint pain and stiffness. Our experienced physiotherapists also offer dry needling to aid the recovery of certain injuries. We pride ourselves on offering evidence-based treatment and ensuring patients have a good understanding of the problem. Health on Grange Physiotherapy is a preferred provider for a number of health care companies which ensures patients get a maximal rebate from their fund. We also offer discount to concession card holders and students.